Benefits: Provides daily conditioning & moisture, Intensifies and protects depth of color, Leaves hair softer adn more rediant. 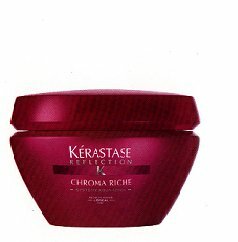 Application: Apply 1 to 2 walnut-sized amount of the Croma Riche Masque to towel-dried hair. Gently massage along lengths and ands. Pay particular attention to the most sensitised areas. Leave for 5 to 10 minutes. Rinse thoroughly.